Using the PayPal integration functionality in AccountSight, users can provide the option to their customers for seamless and instant online payment of pending invoices. PayPal ensures a secure and direct money transfer from the customer to the user’s account which essentially reduces the instances of late manual payments and helps users to manage their cash flow by reducing accounts receivables. With the PayPal functionality enabled by the user, the customers can instantly pay the bills now with practically no payment delay. The PayPal online payment process is secure and risk free. 1] Upon receiving the invoice email, the customer can find a View and Pay Invoice link on top of the email. Click on that link. 2] The online invoice will appear. A Pay button will be visible on top of the invoice. Click on that Pay button to make an online payment. 3] The PayPal payment window will appear on the screen. Now the customer has two options to pay the bill. Customer can use his/her own PayPal account or he/she can directly use a credit or debit card for online transaction. 4] To pay using a PayPal account, the customer first needs to log in to his/her account and can then transfer money from his/her account directly to the user’s account. 5] Instead of a PayPal account, the customer can also use a debit or credit card for online payment. 6] Upon successful completion of the online payment, the customer will receive an email confirmation. 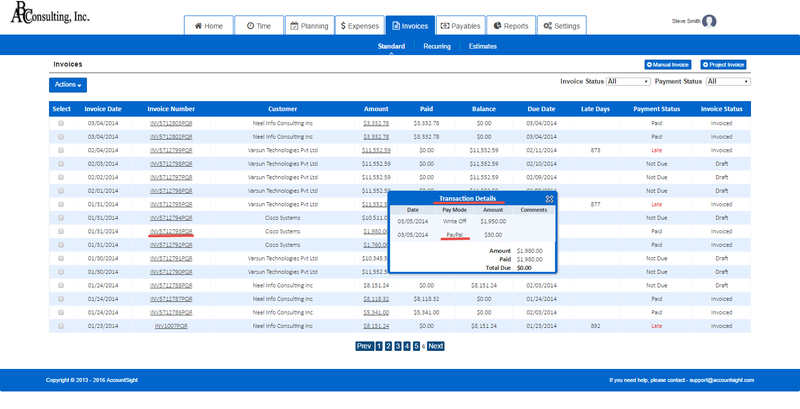 7] Once the transaction is completed and the invoice is fully paid, the invoice status is automatically changed to Paid. This feature saves a lot of time for the user because he/she doesn't have to manually reconcile the payment status as the reconciliation is automatic and gets reflected in the accounts receivables reports.